After singing Zerlina in Mozart’s Don Giovanni with James Conlon and the Chicago Symphony at this summer’s Ravinia Festival, Pérez looks forward to making her house and role debuts next season as Desdemona in Verdi’s Otello at Houston Grand Opera and as Micaëla in Bizet’s Carmen at the Metropolitan Opera. Besides headlining a new production of La traviata at Zurich Opera, in 2014-15 she will also sing Mimì in La bohème at Hamburg State Opera, and portray a pair of Donizetti heroines – Adina in L’elisir d’amore and Norina in Don Pasquale – at the Bavarian State Opera and Barcelona’s Gran Teatre del Liceu, respectively. In concert, the soprano will join her husband and frequent co-star, tenor Stephen Costello, for programs of operatic duets at Washington National Opera, Dallas Opera, and Opera Philadelphia, where they launch the company’s 40th Anniversary Season with a special gala performance in the city where they first fell in love. Already something of a calling card for Pérez, the role of Violetta in La traviata was the vehicle for five of her operatic engagements in 2013-14. She launched the new season at the Hamburg State Opera, opposite Costello, before revisiting Verdi’s doomed heroine at Spain’s Ópera de Oviedo and the Bavarian State Opera. Pérez and Costello reunited in those roles at San Francisco Opera and London’s Royal Opera House, where Pérez had already been hailed as “an ideal Violetta” (Observer, UK). She returned to Covent Garden to undertake the title part of Massenet’s Manon in Laurent Pelly’s celebrated treatment, and to make her role debut as Liù in Puccini’s Turandot, before closing the opera season as she began it, opposite Costello in Verdi at Hamburg State Opera, this time as Gilda to his Duke in Rigoletto. She made her U.S. solo recital debut at Philadelphia’s Kimmel Center, and graced a “dream team of opera singers” (New York Times) at the Richard Tucker Music Foundation gala at Lincoln Center’s Avery Fisher Hall. 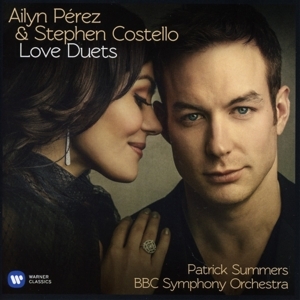 Dubbed “America’s fastest-rising husband-and-wife opera stars” (Associated Press) and praised for their “palpable chemistry”(New York Times), Pérez and Costello teamed up for operatic duets at the “Classic FM Live” gala at London’s Royal Albert Hall, and released their Warner Classics album debut, Love Duets, which was recorded with the BBC Symphony Orchestra under Patrick Summers. The soprano’s previous career highlights include headlining La traviata and Manon on a Japanese tour with the Royal Opera, when the UK’s Guardian pronounced her performance “an unalloyed triumph,” and appearances at Los Angeles Opera, Dallas Opera, Cincinnati Opera, San Diego Opera, Florida Grand Opera, Opera Theatre of Saint Louis, Michigan Opera Theater, Opera Company of Philadelphia, Covent Garden, Milan’s Teatro alla Scala, Berlin’s Staatsoper Unter den Linden, Hamburg State Opera, Zurich Opera, Valencia’s Palau de les Arts Reina Sofía, and Chile’s Teatro Municipal de Santiago. Besides those already mentioned, her notable roles include the title character in Gounod’s Roméo et Juliette, Marguerite in Faust, Amelia Grimaldi in Simon Boccanegra, Pamina in Die Zauberflöte, Leïla in Les pêcheurs de perles, Lauretta in Gianni Schicchi, Marzelline in Fidelio, Suzel in L’amico Fritz, Anne Trulove in The Rake’s Progress, and the four heroines in Les contes d’Hoffmann. Pérez has performed at London’s Rosenblatt Recitals and Berlin’s German AIDS Foundation; has taken part in Schubert’s Mass in C, Mozart and Verdi’s Requiems, and Mahler’s Second Symphony; and has appeared in concert with José Carreras, Andrea Bocelli, and Plácido Domingo, opposite whom she sang in gala concerts at the Royal Opera House and headlined a concert performance of La bohème at the Salzburg Festival. Ailyn Pérez is a graduate of Philadelphia’s Academy of Vocal Arts and Indiana University. She is a recipient of the George London Foundation’s Leonie Rysanek Award, a 2007 winner of a Shoshana Foundation Career Grant, placed second in the 2006 Plácido Domingo Operalia Competition, and has been honored by the Loren L. Zachary Foundation, Opera Index, and the Licia Albanese-Puccini Foundation.